In just a few days I’m going to start NaNoWriMo and it’s already making my body feel like I’m throwing myself off a cliff without a parachute. I know intellectually writing 50,000 words in a month is not a life-threatening endeavor. However, it still produces significant amounts of stress and adrenaline! Of course, I’m excited to be starting something new. I like the plot and characters I’ve created to work with, and I know I’m prepared. But I’m also seriously freaked out, because I know I’m about to engage in a 30 day war with my inner critic, and it will not be pretty! There will be blood spilled–mine. A bit of innocence lost–mine. And some stupid and humbling mistakes reviled–also mine. Whereas Heather has made friends with her internal editor, mine is a nasty bully. I even wrote about her a while back and compared her to a giant Yeti inside my brain. My inner critic has one goal: to reduce me to a quivering mass of Jello. She’s pretty darn good at it. She has convinced me to hide finished projects away that maybe don’t deserve the solitary confinement of trunking. She has talked me into pulling back when I want to be brave and use controversial themes or questionable topics. And she waves every single mistake and writing rejection I’ve earned in my face as proof of my ineptitude. Worst of all, ever since I signed up to do NaNo, I’ve had the feeling I painted a big red bull’s-eye on my self-confidence and gave my internal editor a gun with unlimited ammo. She’s been shooting and I’ve been running ever since. And NaNo hasn’t even started yet! But the important thing is I am still running. I’m haven’t stopped writing or given up. Maybe I’m not the writer I want to be, which is what gives my inner critic so much power over my emotions, but I’m working on it. They say rejection kills the dreams of many writers, but I think it’s exhaustion! At some point, anyone can grow tired of running toward goals that never seem to get any closer. I know I’ve gotten tired of running from my inner critic more times then I can count. While I can’t turn off that little voice of self doubt inside my head, I can chose to keep chasing my goals anyway…even with a bloodthirsty internal editor hot on my trail. I think every writer has a strategy for dealing with their inner critic, and during NaNo I will try just about one of everything to keep pushing through. I will shut off my monitor, and stick double sided tape on my delete key. And mid-month, when things get really bad, I might revert to one of my newest methods of placating my editor: I will draft an epic ode to my inner critic. In that letter I’ll surrender to my editor’s better judgment and own up to my writer suckage 110%. I might even shed a few frustrated tears. There is something cathartic about accepting that I’m never going to be perfect, and by surrendering the hope of perfection, I release massive amounts of negative emotion. When I’m done with my ode, I’ll be ready to fold up my little white surrender flag and live to write other day. Hopefully I’ll be a wiser and braver writer than I was the last time I almost let my inner critic get the best of me. Come November 1st I plan to leave my inner critic some nasty messages to stay away! I also plan to taunt her when I cross the finish line on November 30st with a shiny new first draft. With NaNoWriMo’s tight writing schedule, there is no time for second guessing every line. How do you silence that little negative voice? Please share your tips. Name her. I have a friend who calls his inner editor Doubt. He pictures him as a raven, pecking away at his writing dreams. Apt, eh? I was toying with Medusa, because in my mind she looks very similar with snakes and all. By naming her, you can put her in her place. But don’t forget to name your muse too, to give them equal footing. Good luck with NaNo! Thanks, Sue. Naming is always good advice. I’ll work on that one. : ) Love your idea of using Medusa, but which one is your muse? Melpomene? Crime and tragedy do go hand in hand. Have you read Natalie Goldberg? 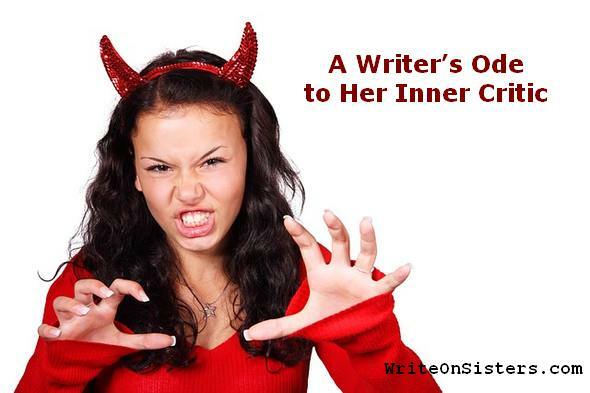 She talks about a bunch of ways to deal with this–she calls it “monkey mind.” What I did was spend 5 or 10 minutes on a free write about whatever the inner critic is telling you, keep it somewhere or throw it out as needed, and then go back to work. She learned to keep quiet. If she has actually HELPFUL feedback, I make a note in a different color in the text as I write. Good for Nano because of word count, lol. Now you know my secret for 50 k in three weeks. Thanks, Rose. I have read Goldberg, but a long time ago. I don’t think I’ll have that much trouble doing my 50,000 words. It will be ending up with 50,000 words I like that will stump me. I’ve read a great tip once for silencing your inner critique! (technically it was for dealing with rejection, but if our past and potential future failures aren’t our critique’s ammo I don’t know what is) Keep a list of all the great feedback you’ve received, the ones which really made you feel like you did good, and re-read over everything when your inner critique speaks up. No, you’re not perfect now and no one ever will be, but someone really liked something you’ve done before. Someone will like what you’re working on now, too. Let your inner critique throw a tantrum if he/she wants, but remember all the nice things people have said already. Best of luck next month!! Someday (read: when I’m not a student anymore) I’m going to use NaNo to write a memoir. In the meantime, I’m going to write a lot of blog posts in November with a smaller word count goal. Yes, chocolate! Also, when you feel your brain getting back on that evil hamster wheel, take a pause, regroup and go back to it later. I am not a writer, but I am a reader. I enjoy reading things that are different from what my husband likes, what my friends like and what my parents like. That is only my little bubble, nevermind the rest of the world. Perfection in writing is not possible because of the diverse readership. Everybody will like something different, so all you can do is be you, write like you are learn along the way. I know that one… But I’ve long learnt to type away and not edit (much) until a few months later. Much easier to deal with the voice that way. Too true, we all need to pull away from that critic voice until the edit stage. That’s when our inner critics are the most beneficial. Try chocolate. Always works for me. More chocolate! I love this group of comments. Thanks, Sharon!